When a family of cook’s decides its about time for that kitchen upgrade, the first thing the wife picked out was the range. She wanted the design to revolve around her KitchenAid 6 burner range. 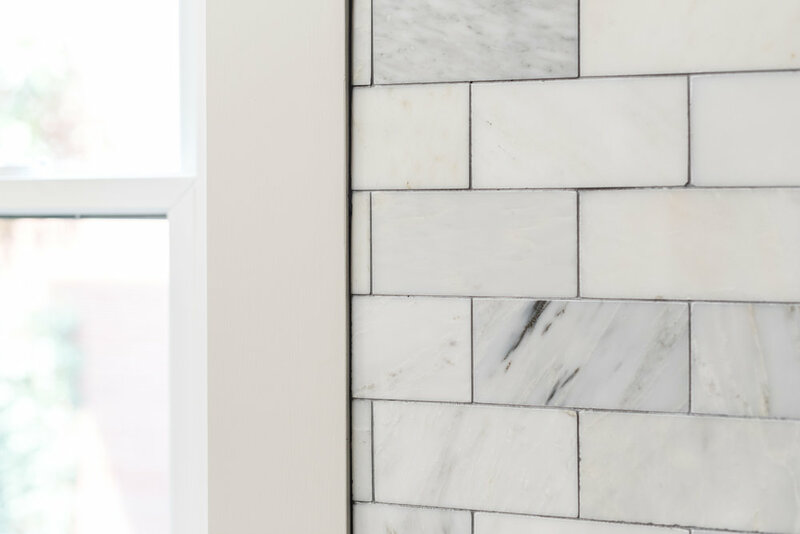 The home is a classic Denver square with a galley style kitchen, this couple did not want to tear down walls + make it larger but rather re-work the plan for a more functional use of space. We kept the basics, the location of water + gas lines, but raised the existing window sill to accommodate a countertop underneath it that’s big enough for 3 chopping stations, relocated the refrigerator, + added a pantry + a wine refrigerator. The goal for the redesign was to maximize space, in both the layout + the organization of the contents of the cabinets. 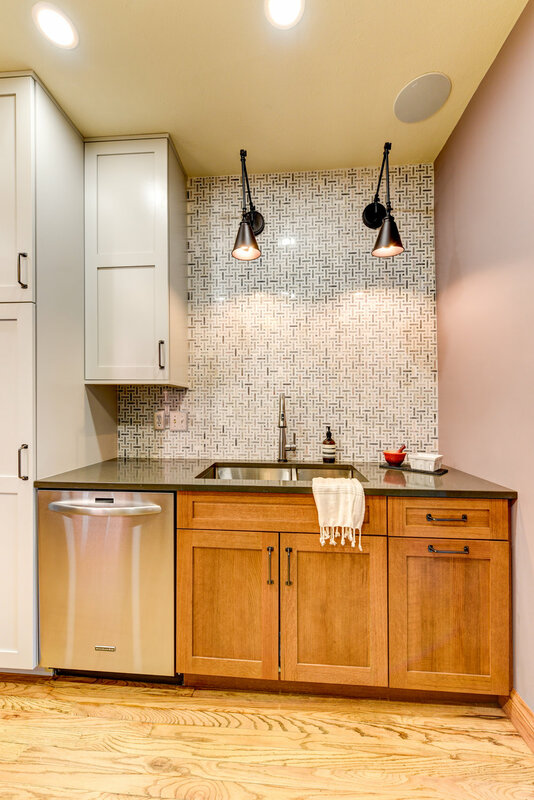 We used deep drawers + a full height pantry to achieve the storage needed for all their cooking accouterments. 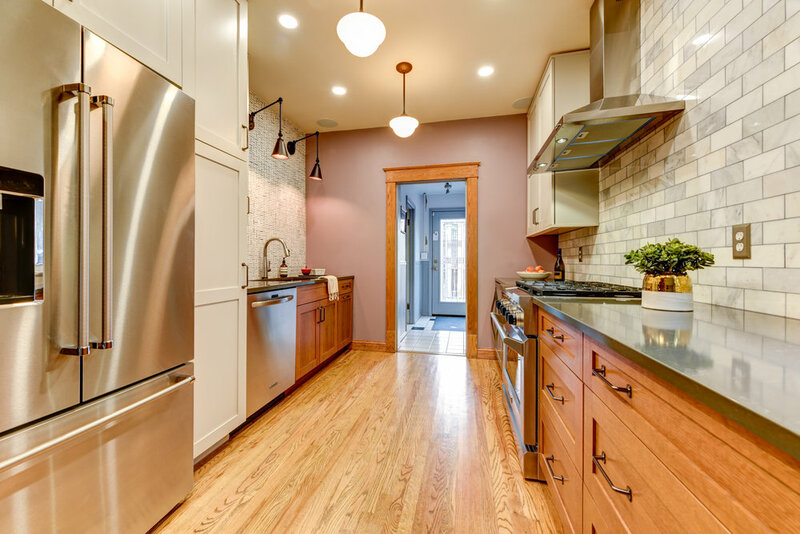 In keeping with the style of the house we added pendant lights down the center, shaker style quarter sawn oak cabinets on the bottom with painted light grey upper cabinets, + a marble backsplash in two different styles. For more pictures look here. All photography of A Cook’s Kitchen project was taken by Ryan Lawrence Photography. Older PostA FRESH New Look on Cherokee!! !